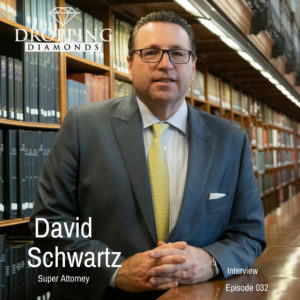 You definitely don’t want to miss this Episode as David Schwartz comes on to Dropping Diamonds and Drops Mad Diamonds. David is a former New York prosecutor, a Lobbyist, and a Criminal Defense Attorney. Schwartz has also represented high profile clients such as Donald Trump and Michael Cohen to name a few. Get to know David from a different perspective. As a Super Attorney, and badass business man. Enjoy Familia!